This Marinara Sauce recipe is super easy to make and tastes so much better than storebought! Even the best jar of marinara sauce in the grocery store can’t compare to a good homemade one. 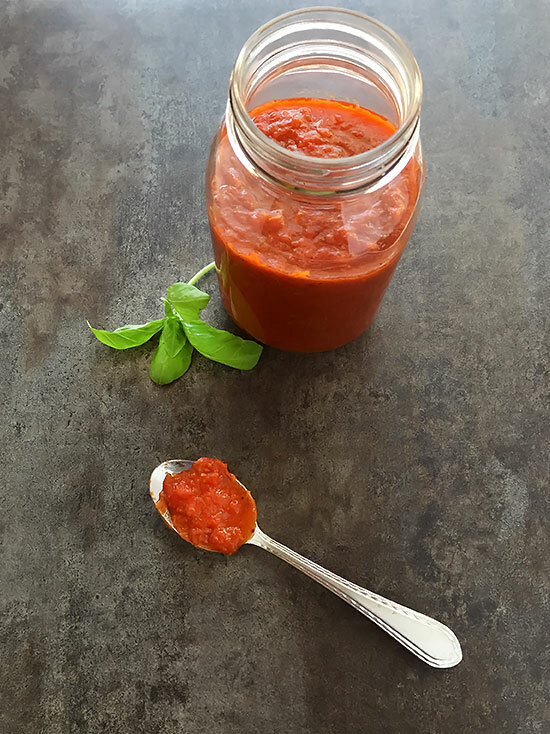 Just a handful of ingredients, about 20 minutes of your time, and you can have your own delicious homemade marinara sauce! If you’re like me, you probably grew up eating one of the two most well known pasta sauces in the supermarket. There weren’t a whole ton of options back then, but now, there are tons to choose from. The quality and taste of store-bought sauce has come a long way since my childhood. I have a few favorites that I do occasionally buy for quick meals, but still nothing beats making your own. Some recipes call for a really long simmer time, but this marinara sauce recipe is done in about 15 minutes. It’s naturally sweetened with some finely grated carrot, so there’s no added sugar. Plus, you get the bonus of sneaking an extra veggie into your family’s diet. 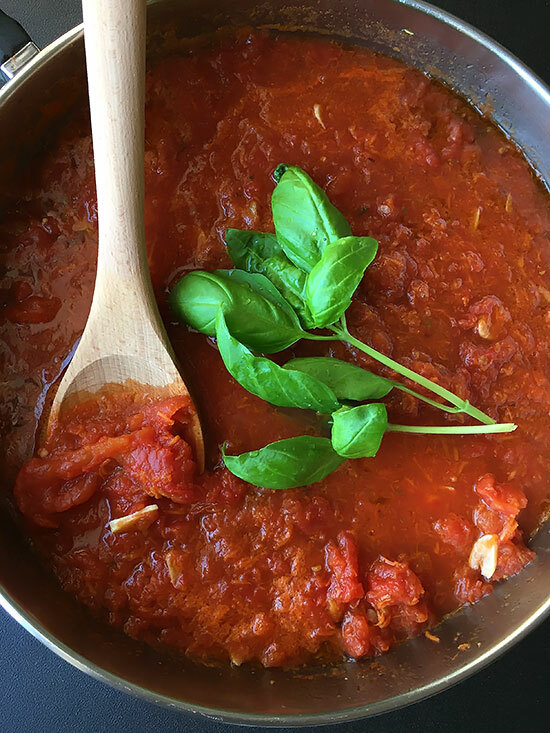 My Marinara Sauce recipe is a slightly adapted version of Lidia Bastianich’s marinara sauce from her cookbook, ” Lidia’s Commonsense Italian Cooking” . Who else loves watching her on PBS? She’s one of my absolute favorite cooks to watch on TV. It’s very important that you use a large skillet and not a deep saucepan to make this sauce. The larger surface area allows the water to evaporate quicker. 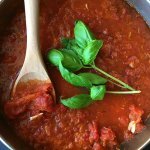 This marinara sauce recipe only takes about twenty minutes to make and tastes so much better than storebought! Pour tomatoes into a large bowl and crush with a potato masher or with your hands. Pour 1 cup water into tomato can and slosh it around so that you get all the juices left behind. Reserve. Heat the olive oil in a large skillet over medium heat. When hot, add the sliced garlic. When the garlic begins to sizzle (make sure not to brown), pour in the tomatoes and reserved water. Stir in the grated carrot, red pepper flakes, oregano and sea salt. Place the sprig of basil (stem and all) on top of the sauce. Allow it to wilt and submerge into the sauce. Simmer until the sauce has thickened some, about 15 minutes. Check the seasonings, adjust if necessary, then serve or let cool, place into an airtight container and place into fridge until using. 1.It's very important to use a large skillet instead of a deep sauce pan to make your sauce. The larger surface area allows the water to evaporate quicker. Adapted from Lidia's Commonsense Italian Cooking.